Download this free study for insights into the dining and spending habits of business travelers and how you can get them in your restaurant! 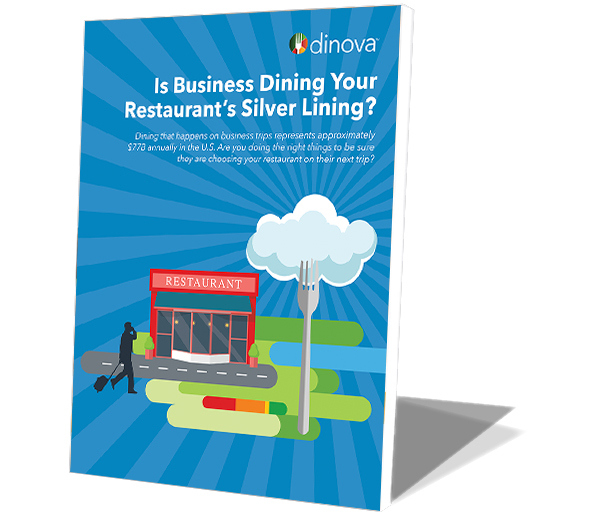 Is Business Dining Your Restaurant's Silver Lining? Dining while traveling for business accounts for roughly $77B in annual spending in the United States. What can you do to get business diners to your table on their next trip? Download our study to find out! By providing this information, you are giving consent to receive emails from us about Dinova's one-of-a-kind advantage. You will have the opportunity to opt out of receiving any communications from us every time we contact you. Please refer to our privacy statement for more detail. Since 2009, Dinova has provided an innovative marketplace that gives restaurants across the U.S. access to an often untapped dining segment. Our restaurant and enterprise partners understand the value of a business patron and know that the connections made over a meal drive understanding and shared perspectives that establish lifelong relationships. Dinova nourishes those connections to create value for restaurant, companies, and the business people we serve every day.